Founder and CEO of @BrickAcademy Dominique Lee talks about winning $30M fed grant, “breaking down walls and building up kids” in #Newark’s South Ward. South Ward Children’s Alliance plans to use $30M @usedgov grant to expand health care, housing, early childhood and other services to Newark's most distressed residents. Former @TeachForAmerica educator and current founder and CEO of @BrickAcademy Dominique Lee runs N.J.’s 3rd-largest CMO, only one led by person of color. See previous 74 interviews: Sen. Cory Booker talks about the success of Newark’s school reforms, civil rights activist Dr. Howard Fuller talks equity in education, Harvard professor Karen Mapp talks family engagement, former U.S. Department of Education secretary John King talks the Trump administration, and more. The full archive is right here. 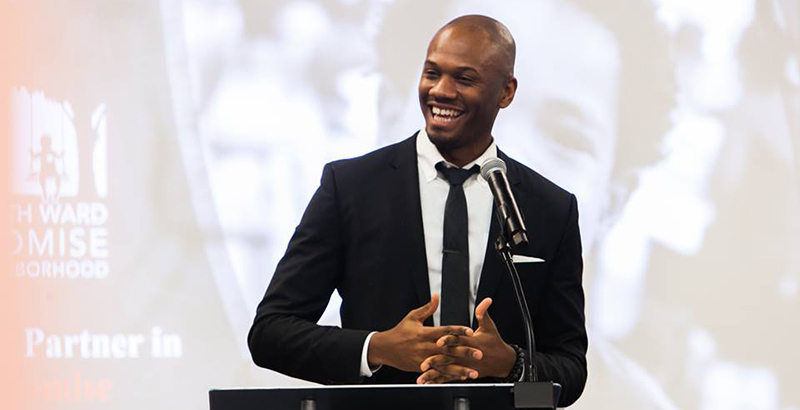 Dominique Lee made headlines as a 25-year-old when he and four other Teach for America alumni took over a failing Newark elementary school and turned it into BRICK Avon Academy, the acronym standing for Building Responsible Intelligent Creative Kids. As was widely reported, a frustrated Lee decided to launch his own school with fellow teachers after seeing ninth-graders at the city’s Malcolm X. Shabazz High School unable to name the seven continents or the state’s governor. Now 33, Lee, and the nonprofit network that began with BRICK Avon and later came to include two other schools and the South Ward Children’s Alliance, are poised to increase their impact and reach. The alliance was one of the few minority-led organizations to receive a competitive $30 million Promise Neighborhood grant from the U.S. Department of Education in 2017. Newark’s South Ward is the city’s most distressed neighborhood, where “children and families [are] exposed to significant adverse childhood experiences and toxic stress,” according to the BRICK Education Network. Its approach to alleviating that generational disadvantage is to offer a continuum of high-quality schools and wraparound services for children and families from birth through college and career. The $30 million will allow the alliance and its partners to offer greater services in several key areas, including housing, health and early childhood. The school network includes BRICK Peshine Academy, a pre-K-8 school run in partnership with Newark Public Schools (Avon Academy returned to traditional district oversight) and Achieve Community Charter School, which launched in 2017 with students in the early grades and will eventually extend to eighth grade. With a soon-to-be-announced partnership with another school network, BRICK aims to educate 3,000 students in Newark over the next few years, making it the state’s third-largest CMO and the only one led by a person of color. BRICK is also looking to open schools in the South Bronx and Buffalo, hoping to reach some 6,000 students and their families in New York and New Jersey. BRICK recently celebrated its first year of impact as one of the partners of the South Ward Promise Neighborhood at a Jan. 24 event noted by U.S. Sen. Cory Booker, who recently announced his bid for president. The 74: Prior to leading The BRICK Education Network, you were one of six teachers who helped drive school turnaround efforts at Avon Academy. Can you tell me more about your experience as one of the teacher-leaders involved in these turnaround efforts? How did this experience ultimately help inform your leadership as the founder and CEO of The BRICK Education Network? Lee: The beauty behind the turnaround efforts at Avon Academy was that I was a part of a group of teachers spread throughout the district that came together and wanted a shot at transforming one of the chronically underperforming schools in the heart of the South Ward. Thankfully, the superintendent at the time was gracious enough to give us a shot at leading this initiative, and restarting Avon Academy definitely propelled us to where we are now on several different fronts. It really gave us a true diversity of student need that has really transformed our model to what it is now in addressing the holistic needs of every single child in the building, instead of simply using a school model that pushes or coaches children out or a model that isn’t conducive to accommodate the needs of different children. When you have 600 bright-eyed and bushy-tailed kids from the neighborhood, they’re all going to have different types of experiences, so you have to design the holistic model to support all of them. Can you discuss why you formed The BRICK Education Network? I’ve always had a tenacity to ensure that black and brown children can be successful. Growing up, I was exposed to the power of education through the lens of my parents. I’m actually third-generation college educated through my dad’s side and first-generation college educated through my mom’s side. My mom is a part of the working-poor class and my dad is a part of the upper-middle class, and from an early age, I saw my mom working multiple jobs, while my father’s life was so much easier, and it was solely because of the education my father was able to attain. As a person of color, I always knew that education was at the core of our march toward equity, which is what essentially directed me to the classroom to pursue education law. I eventually deferred my law program to enter the Teach for America corps and then I ended up stayed in the teaching profession. The moment that sparked the creation of BRICK was a graduation ceremony I attended while I was teaching. At that point in time, I was working with an afterschool tutoring program for struggling seniors to help them on their alternative assessments they needed to take in order to graduate. I quickly realized that many of these children were not able to read, and I also noticed that many of them ended up graduating because we had passed them along, and that was not something that I was willing to continue to endorse. Ultimately, I didn’t want to be involved with schools where kids, especially black and brown children, weren’t leaving the way we wanted them to. This was essentially one of the sparks that motivated me to do something different and to start as early as possible. How does your network’s charter school model stand apart from others in New Jersey and elsewhere? When you look at our model, you can look at it in four buckets: one, strong academic programs; two, character development; three, wraparound services; and four, changing public policy. What really makes us different is how we think about school culture. We don’t look at it through a lens of control, but rather, we look at it through a lens of how we’re working to empower children to own and know their identity and essentially use their identity as an asset to society. We can achieve this by providing a safe place for our children to actually explore their identity. What we mean by this is that every child needs to have a caring adult or some relationship in the school. There also needs to be a warm, nurturing environment where children walk in and feel like they’re able to be who they are. Of course, routines and structures will be in place because kids and adults like order and we need order to ensure that things are functioning well. Once this is accomplished, then we proceed to examine how we get our kids to explore their identity by ensuring they see themselves throughout the texts that they’re reading and the conversations that we may have about leaders that reflect them. We seek to build an environment that they see on so many fronts and exposes them to as many successful people that look like them, which often contradicts mainstream media’s narrative about their identity. Last, but not least, we want to ensure that when they leave us, they’ll use their identity to be change agents in society. What truly separates us from other organizations is that we genuinely believe that in order to serve our children, you have to be able to partner with other organizations and create an ecosystem for children to be successful. We accomplish this by having a robust pipeline of partnerships to support our families and children around housing, health, and economic mobility services. This is not to say we’re accomplishing this all by ourselves or that we’re taking our focus away from academics. This means that we’re not blind to the situations around us and that we’re being proactive in seeking partnerships and creating systems in place to best support our families and our children. We’re a CMO that focuses on neighborhood transformation, and not just school transformation, specifically in terms of transforming ourselves in the school. We focus on becoming good stewards and partners in the communities we serve, and we continue to use an institution, like a school, as a beacon of hope for a community that has historically been underinvested, redlined, and everything under the sun. Your organization seeks to “break down walls and build up kids.” What exactly does this look like in practice? Breaking down a wall is breaking down silos between our schools and a housing partner, for example. As for building up kids, we recently had a case where a student’s family was about to get evicted about a month and a half ago, and our family coach intervened and helped place them in one of our partner houses to prevent the family from having to enter a homeless shelter and essentially provided the family with a more sustainable housing opportunity. We broke down the wall of silos between the schools and the housing partner, we broke down the wall of a kid going to a homeless shelter, and then we broke down this wall that we’re not just educators, we’re a movement working to holistically support children. We’re building up kids by ensuring that they have a stable home to live in to be successful. Another example is recognizing that schools are not here just because they got here. We’re talking about many years of segregation, racism, trauma, etc. that haven’t been addressed in our communities and often manifested themselves in ways that might not look or feel comfortable. So, we’re breaking down a wall by ensuring that teachers are aware of how we got here, and we’re building up kids by ensuring that we’re finding proper teachers that believe that this is a movement that goes beyond teaching the fundamental concepts of 2+2. What does it mean to be the one of the only minority-led organizations to win the competitive $30 million Promise Neighborhood grant from the Department of Education? What are you planning to do with the grant money? It’s a blessing and we’re extremely humbled to receive this grant, yet it’s also a little troubling to recognize that we’re one of the few minority-led organizations to receive this grant that’s designed to help minority neighborhoods. While it’s troubling to acknowledge this fact, it empowers us to understand that we’re doing this work to ensure that we’re breaking down these cycles in hopes that the kids we’re educating will continue to grow and build their own organizations that do this type of work. We’re planning on beefing up our strategy of creating a pipeline that moves children from birth through college and career. This will require us to take a closer look at what our strategies around early childhood, school, housing, etc. look like to basically provide us with an infusion of resources to helps us implement our overall vision. Tell me more about the organization’s plans — what are your top priorities over the next few years? Why are you seeking to expand specifically in Buffalo and the South Bronx region? One of our top priorities is to develop at least three proof points to holistically support children in a model like ours. Newark, Buffalo, South Bronx are all proof points, with similar demographics but different conditions on the ground. In Newark, we’re doing a lot of the work ourselves, which means we’re creating a lot of the external support systems, linking with partners, creating the schools, etc. It’s a very intensive project here. The South Bronx and Buffalo actually have a pretty robust external support system for children and families, but what they’re missing is quality education. So, we’re looking at taking our model and being a more partner-centric model, in which we run the schools and the partners outside are ingrained in our school model with a common thread among our values. We believe in this type of a sustainable model because there’s already public dollars flowing to communities through these organizations and it’s our job to work with each other and build the technology infrastructure to share information. We also believe that building this proof point, or case, is so necessary because if we’re able to serve children who’ve gone through adverse childhood experiences, I think we’d all be better off in terms of the statistics, such as kids being labeled in terms of behavior disorders, not having productive adult lives, etc. 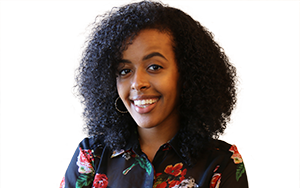 We’re ultimately a part of the strategy of ensuring that black and brown children are leaving with a sense of who they are and are fully comfortable with their identity. What are some strengths and challenges associated with BRICK’s two-generation model (one that combines parent and child interventions to interrupt the cycle of poverty)? One of the strengths is that we see the positive results on an individual level. On the contrary, one of the challenges is that doing this at scale and measuring it at scale continues to remain a daunting task. Another challenge is being able to truly support our families with the resources they need. As a society, the more we continue to cut back on safety-net programs [low-income housing, food stamps, health care], it’s only going to exacerbate these cycles of poverty. What do you want people to know about the significance of a CMO led by a person of color? It is a reflection point for us to ask ourselves if we’ve replicated the same racist structures in the school space that we’ve seen in any other spaces, such as business communities. To be one of the few CMOs led by a person of color is certainly something we should ponder about. However, knowing this does allow us to continue to build on the legacies of our ancestors, who were working to create schools in the South during the Reconstruction era. Correction: The $30 million Promise Neighborhood grant is earmarked for community services, not school expansion, and Avon Academy is no longer part of the BRICK Education Network. An earlier version of the story included incorrect information about how the grant could be spent and the schools that are currently part of the network.